There has been a noticeable increase recently in the number of semi-submersible and jack-up vessels anchored in the firth and berthed at the quayside in Invergordon, with around 10 rigs currently in the deep water North Sea inlet. The giant West Phoenix, which at 35,000 tonnes, last year became the largest rig by gross tonnage to berth there, is also anchored close to entrance to the firth. Yesterday, a spokeswoman for the Port of Cromarty Firth said that although two vessels were due to leave this week, the numbers were expected to rise again. She said: “It’s likely we will have as many as 12 rigs in the Port of Cromarty Firth over the winter. Despite speculation about the future of a number of the rigs, she added the port authority was not aware of plans to scrap any of those currently stacked. The two departing the waters this week are bound for projects in the North Sea. The new build Maersk Highlander jack-up has been undergoing commissioning work, carried out by Semco Maritime, after being transported to Invergordon Service Base from the Jurong Shipyard, Singapore. The Maersk Highlander will work on the £3billion Culzean gas development, 155 miles east of Aberdeen. Another jack-up owned by the Danish company, the Maersk Reacher, is currently undergoing upgrading and modification work at the quayside in Invergordon. Also leaving the Cromarty Firth this week will be the Paragon MSS1. The semi-submersible, built in 1979, has been undergoing intermediate classification and service works, also carried out by Semco Maritime. The rig, owned by Paragon Offshore, is believed to be heading for a North Sea drilling contract for Nexen. More inspection, repair and maintenance projects are in the pipeline at Invergordon, according to the Port of Cromarty Firth spokeswoman. She added: “Companies on the Port’s Service Base, including Semco Maritime and Port of Cromarty Firth Services, are working hard to attract project work to Invergordon. “The Port of Cromarty Firth remains one of the leading ports in Europe for rig inspection, repair and maintenance. The firth is an ideal, sheltered environment with a highly skilled and experienced workforce. The Transocean Winner at the start of its refloat operation. The sheen is said to be associated with the ongoing pressurisation of tanks to maintain the rig’s stability, but a Brigg’s Marine and Environmental Services team is accompanying the tow and assisting by “breaking up the light sheen”. Hugh Shaw, the Secretary of State’s representative for maritime salvage and intervention, said: “We are taking advantage of the favourable weather conditions following this big step forward, and we will continue to closely monitor the rig whilst it is under tow. “Once everything is declared safe, I will be looking at releasing the exclusion zone in Dalmore Bay. “I would like to offer my sincere thanks to the Western Isles Council and community for their patience and their gracious hospitality during this challenging and disruptive period. 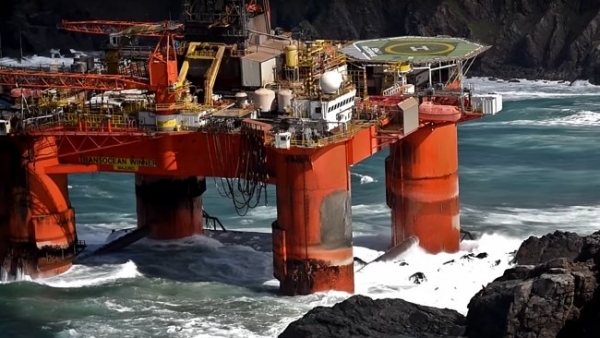 Transocean will then begin the assessment process – which includes putting divers in the water – to look at the damage the rig has suffered; a process which could take until the middle of September. A 300m exclusion zone around the rig will remain in place while the salvage work continues. There will also be a 1km exclusion zone while it is towed from Dalmore Bay to Broad Bay, on the east coast of Lewis, some 54 miles (87km) away. The grounding of a 17,000-tonne oil drilling rig carrying 280 tonnes of diesel last week highlights the need to reinstate axed Emergency Towing Vessels (ETV), the union Nautilus has said. The union was speaking after the Orkney-based Herakles – Britain’s only remaining ETV, operated by the Maritime and Coastguard Agency (MCA) – was deployed to assist the Transocean Winner rig which ran aground on the Western Isles of Scotland on 10 August after breaking from its tug in heavy seas. The Marine Accident Investigation Branch has begun an inquiry into what happened as the semi-submersible platform was being towed from Norway to Malta. It is understood that from Malta, the rig was to be taken to a yard in Turkey to be scrapped. Nautilus general secretary Mark Dickinson said: “The incident highlights the vital work that the Maritime and Coastguard Agency (MCA) do in protecting life at sea. If the ETV had not been available then lives would have been at risk and the chances of environmental damage would have been greatly increased” (Risks 761). The union leader added: “The government only agreed to retain the use of Herakles in Orkney last month and this highlights how important that decision was. I hope the government looks closely at this incident and reconsiders the risk for other coastal areas of the UK not served by government-funded ETVs.” The union has run a lengthy campaign against the axing of the crucial safety vessels (Risks 587). The four ETVs were introduced after the Braer and Sea Empress tanker disasters, but three were withdrawn following the 2010 public spending review.